Photograph collection of webmaster. 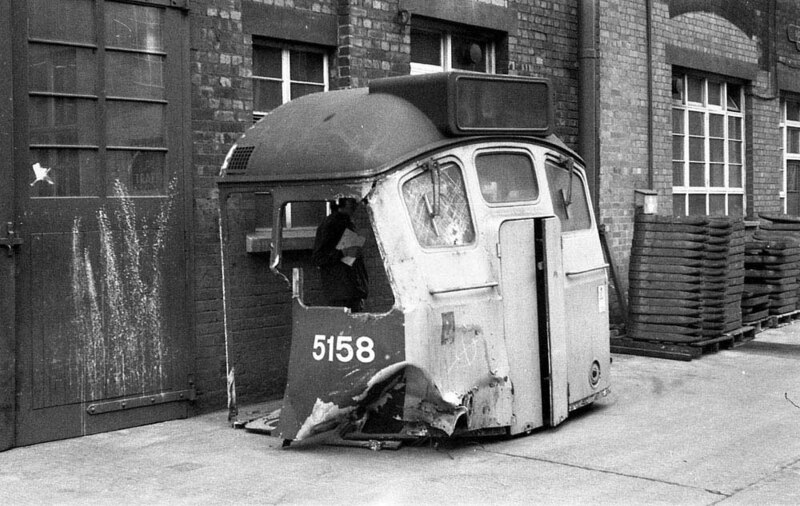 Collision damaged 25008 at Haymarket depot, sometime during June 1980. The eighteen year eleven month career of D5158/25008 was split between Eastern & Scottish Region depot allocations. Modified Headcode boxes - Class 25/1 style (with horn receptacles) No.1 cab only. Circular gauge added to fuel tank (Class 25/0 only). Time between last Classified repair and withdrawal: 10 months. Time between withdrawal and scrapping: 2 months. July 1971 to Holbeck (55A). April 1974 to Haymarket (64B). 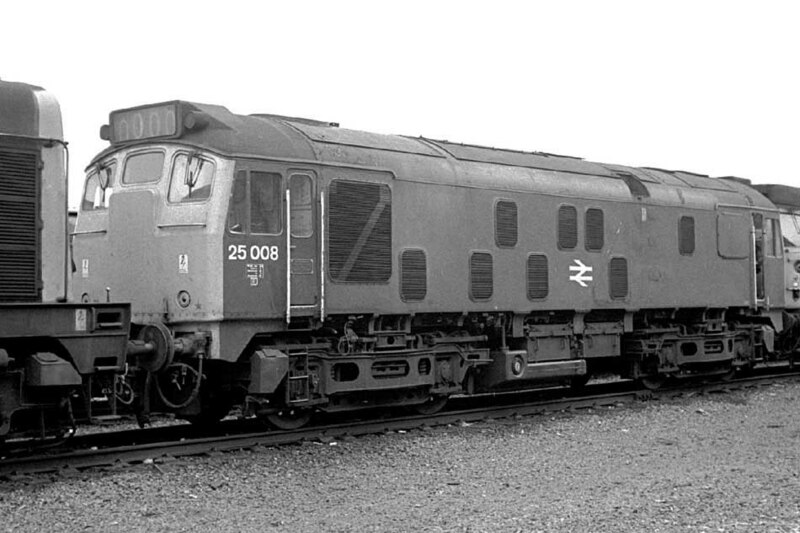 25008 was the 32nd Class 25 withdrawn, the only Class 25 retired during June 1980. 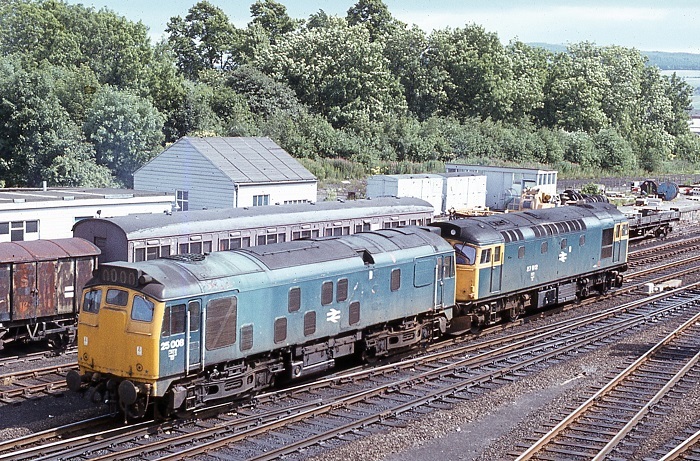 25008 was withdrawn after sustaining collision damage, it was quickly removed to Glasgow Works - the TOPS report indicates it was received here on June 16th and was cut up by the end of August 1980. Noted Darlington Works February & August 1963. Noted Derby Works March & April 1965. Noted Derby Works May 1968. Noted Derby Works January & March 1973. Noted Derby Works April & May 1975. Noted Glasgow Works June & July 1979 (Intermediate repair). 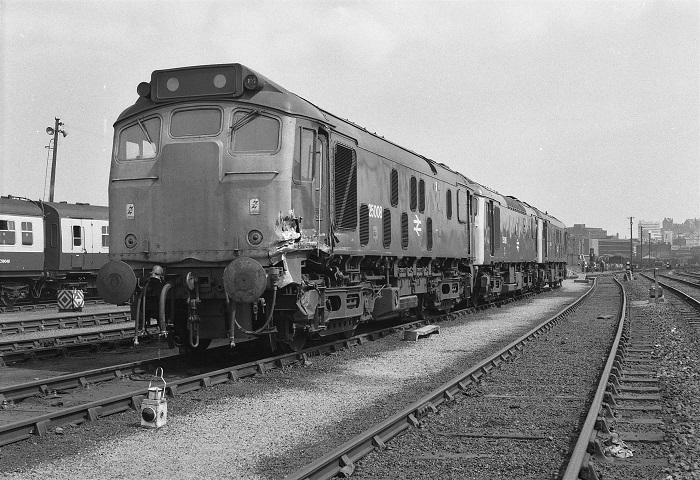 The frames of D5158 were laid down at Darlington Workshops during the spring of 1961, part of an order for twenty five Type 2's, the first batch to be fitted with the uprated 1,250hp Sulzer 6LDA28B engine. D5158 was released from Darlington during early July, like the rest of this order they were delivered to Thornaby (51L). On February 5th D5158 was noted dragging 48392, 76040 & an unidentified V1 south through Northallerton, the 8F was noted with its cab missing. On April 8th 6782 hauling the 11.40 Lincoln - Newcastle failed at Darlington, 5158 came to the rescue taking the train on to Newcastle. After ten years allocated to Thornaby 5158 moved to Holbeck during July. This was of the Class 25/0s that were never allocated to a London Midland Region depot. 5158 remained at Holbeck for six months, during January it moved to Eastfield (65A). 5158 was at Derby Works from January to March. Photograph courtesy Peter Lovell The date of this view is uncertain but it could well coincide with the visit of 5158 to Derby Works during the first quarter of 1973. It certainly would explain the fitting a later style roof/headcode box to 5158. In exchange for the Scottish Region receiving four boiler equipped Class 25s, 25008 was sent south to Tinsley during February, during its time at Tinsley 25008 spent April and May under repair at Derby Works. Tinsley was, for a brief time now home to all the Class 25/0's. During August 25008 returned to Eastfield as part of the reshuffling of motive power involving the mass withdrawals of the LMR & ScR Class 24's. Photograph courtesy Adrian Healey 25008 & 27012 south of Perth station sometime during the summer of 1975. This view clearly shows the later style cab roof fitted to the No.1 end cab. On September 29th the 11.30 (?) Glasgow Queen Street - Edinburgh was worked by 25008 & 24147. On the afternoon of October 6th 25008 & 26029 worked six brakevans north over the Highland mainline. On October 12th a Bishopston – Mossend ammunition train derailed all but four of the thirty three wagons just south of Hamilton Central station. The locomotive, 25008 remained on the tracks. The majority of the wagons derailed in Barncluith tunnel, the Army taking three days to safely remove all the explosives, with a further four days required to relay the track and replace the overhead equipment. 25008 was noted at Perth stabling point on April 9th. On August 30th the 22.35 Euston - Perth was worked forward from Mossend Yard by 25008. Photograph courtesy Tony Sayer 25008 stands at Polmadie on October 29th 1977. On July 1st the 21.14 Glasgow Queen Street - Dundee was worked by 25008, on July 7th & 29th it worked the 11.03 Perth - Edinburgh. The 16.53 Perth - Arbroath and the 18.33 Arbroath - Dundee on August 3rd were worked by 25008. During the last week of the month on August 26th 25008 worked the 08.03 Glasgow Queen Street - Scarborough to Edinburgh, whilst on 31st it worked a seven coach Glasgow Queen Street - Aberdeen service. Glasgow Works received 25008 for an intermediate repair during June & July, possibly the last Class 25/0 to receive a classified repair. On July 24th the 10.44 Glasgow Queen Street - Dundee was worked by 25008 & 26011, with 25008 returning on the 13.38 Dundee - Glasgow Queen Street. 25008 was transferred to Haymarket during January, this was its last move. 25008 was noted at Edinburgh Waverley with a permanent way train on January 13th. 27003 & 25008 were noted at Perth fuelling point on January 24th. 25008 was noted at Ayr depot on February 10th. 25008 was withdrawn on June 9th 1980. Page updated November 3rd 2018.